Even if your rabbit resides in multilevel rabbit condo, complete with all the bells and whistles, he still needs room to hop and explore on a daily basis. Without regular exercise, a rabbit is at risk of medical conditions such as obesity, pododermatitis, poor bone density and poor muscle tone. Building a rabbit pen creates a “rabbit gym" that offers a safe location for your rabbit to exercise and explore. If you're not a DIYer, consider a simple "X-pen" or exercise pen puppy enclosure available from pet stores. Place stakes in the ground to mark the corners of your desired exercise pen. Choose a location which has shaded areas so your bunny can escape the sun. Tie string from stake to stake to establish the pen perimeter. Following the string as a guide,use the shovel to dig a 1-inch-wide, 4-inch-deep trench around the perimeter. Pound the T-posts into the four corners, just inside the trench, with the T-post driver. Four T-posts in the corners will create a 6 by 6 foot exercise pen. T-posts should be no farther apart than 6 feet. For larger pens, place additional T-posts at intervals of 6 feet or less. Unroll the roll of chicken wire and line the end up against the first T-post. Set the bottom of the chicken wire into the trench. Attach the end of the wire to the T-post with zip ties from top to bottom. Continue to unroll the chicken wire, setting it into the trench, until you reach the next T-post. Repeat until you return to the starting T-post. Pull the wire tight as you attach from post to post, ensuring it does not sag. Fill the trench back in with dirt. Placing the chicken wire into a trench, then filling in the trench and packing it well, keeps digging rabbits from escaping. Place your rabbit's food and water bowls in the pen, then let your rabbit enjoy his new space for a little bit each temperate day. Choose the location of your indoor rabbit exercise pen. Place a plastic tarp on the floor to protect against accidents, spills and scratches. Cover the tarp with a piece of indoor/outdoor carpet. Set up the X-pen panels to create a barrier wall. X-pens are eight 2-foot metal fencing pieces, attached together with hinges, that can be easily set up or collapsed and stored flat. Raise the panels and place in the shape and position you desire. Place your rabbit’s litter box, food bowl and water bowl inside the exercise pen. 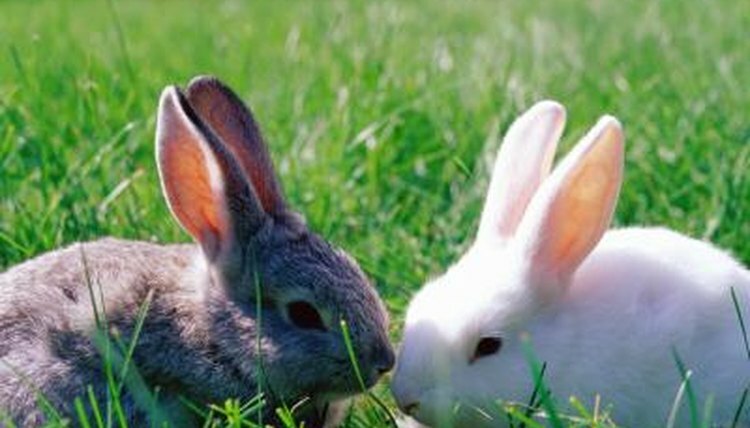 Rabbits should have access to clean water at all times and need food for energy. Add toys to encourage exercise and free play. Using the utility knife, cut holes and doors in a old cardboard box. Place the box inside for the rabbit to climb through and explore. Place treats inside crumbled-up newspaper or old toilet paper rolls with the ends folded closed. Your rabbit will play and chew on the paper or cardboard while working to get his treats.  To create larger indoor exercise pens, connect two or more x-pens together.  For outdoor exercise with an X-pen, move the pen outside and secure it to the ground with tent stakes. Cover a portion with the plastic tarp to provide a shaded area.  A shower curtain is an alternative to a tarp to protect flooring from liquid or scratches. In place of carpet remnants, use blankets or towels. ⚠ Always supervise exercise time outdoors. Some rabbits find digging a great form of exercise and will try to find a way to dig out of a pen. Watch out for predators, such as the neighbor’s dog or cat, hawks, eagles or other wild animals.